100 MB to GB - What Can You Do with 100 MB of Data? 100 MB is equivalent to 0.1 GB of data and MB stands for Mega Byte. The smallest plan at US Mobile is 100 MB, and you have to be a light user in order to suffice with that amount of data per month, or remain connected to WiFi for most of your online activity. If you use lots of data, our unlimited data plan might fit you better. 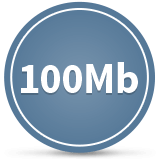 What Can You Do with 100 MB? Send and receive 100 text emails, including attachments. Browsing the web for approx. four hours, without downloading pictures and videos. Use Waze or Google Maps for one hour of navigation. Enjoy streaming music for about 1 hr and 20 min. Flick the switch for “Cellular Data”, to turn it off. Another alternative to making due with a low data plan is to get a WiFi Plan. US Mobile offers an unlimited Wi-Fi plan, which works in the air and on the ground. For $10 you get unlimited WiFi for a 30 day period. Get inflight WiFi. I’m not sure I understand. Is this saying that I need a WiFi plan to connect to my home and work WiFi networks? No, it does not, the WiFi plans allow customers to connect to millions of hotspots around the world so they don’t have to always rely on data plans. In addition to hotels, coffee shops, convention centers, etc., the WiFi plans will also work in-flight on most major airlines (at a fraction of the typical inflight wifi cost). Hello, does this mean that with 100 MB you can do all four things that you listed, or just one of them? Hello, will i need passwords for the hotspots with a wifi plan? The WiFi plan is no longer available. We had a limited number of passes that sold out fairly quickly. But to answer your query, with the WiFi plan you had an app that would let you see available hotspots and connect to them without needing to enter passwords. Can I watch am episode of eastenders with 1gb of data ? Auto – stream to the highest quality depending on your internet speed (~3 hours per GB). Low – stream 4 hours per GB. Medium – stream 2 hours per GB. High – stream 1 hour per GB. Unlimited – if you don’t have an unlimited plan, you should forget about this option as it’s about 20 min of watching per GB. Now these aren’t hard and fast rules, but I think it’s a safe bet that one episode won’t be a problem. For more info check out Whistleout’s data estimator tool here.